Lots of good recipes in this book. I would recommend it to anyone who likes to Barbecue. BBQ Cooks Need This Cookery Book! We have Grilled Beef Burgers while Snow was Coming Down! Passionate? Yes! 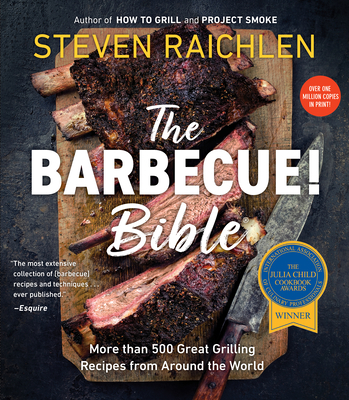 Steven Raichlen has a Gift for All Foods Grilled.Gave a copy as a Gift to Relative w/Racks of Ribs. Plus,Sauce of course! He was Thrilled! No One has been as Inspiring as Chef Raichlen.Even Vegetarians can be Involved in Grilling.No One is Left Out,Ever.That makes this a Perfect Gift. Buy a copy same Time for Yourself. The book was loaded with all kinds of hints and tips for a great barbeque experience. This is a great book by the barbecue guru,in the book he gives you easy to follow recipes and plenty of helpful tips to make your next barbecue the must attend event of the summer,if you are as serious about your barbecue as I am I heartily recommend that you pick up this book it's "finger lickin good". Lots of practical and appetizing recipes. If you like to barbecue you should have this book.